Order of training theory; thank you for your response to the Jac series! Having said that, I am doing my best to keep up with you. Thank you to each and every one of you who has watched the Jac Diary and to all of you who have left comments on the blog or on Facebook. It is really me who is ‘liking’ them and responding to them! I also read all the comments on the blog personally. I cannot promise I will aways keep up. I do have a husband, three sons, a barn full of horses, and laundry to do! But I will do my best. Stacy, I have a question. Why didn’t you opt to desensitize Jac to the stick and string prior to your first session with it (I think episode 3)? 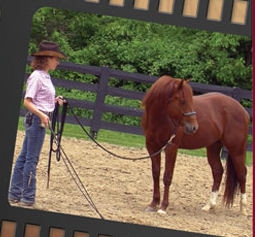 I’m just wondering because in the past, I have seen many folks get the horse used to the lunge whip, carrot stick, or what have you touching them and flipping around them before they begin to teach the horse to lunge. I’m always curious to learn new tools and techniques and your method spiked my curiosity:) Thank you! I was basically doing a combo. If you watch around 7:40 I explain how I was ‘desensitizing’ and it turned into lunging. A combo of what you were asking. Episode 1; I was watching him. Episode 2; I carried the stick n string as an extension of my body. Episode 3; was both ‘desensitizing’ and ‘sensitizing’, if we want to use those words. Before began desensitizing I was making sure I could keep him away from me. Making sure he respected my space and would move away….away being the key word because that would keep us both safe. Notice how far away I stay from him….and require him to stay away from me. We both need to ‘earn’ the right to be in each others space. I would have had serious trouble directly approaching ‘desensitizing’ without somehow moving his feet first because he was so green. Also, because he showed signs of confidence (1:22) bordering on aggression I needed to know he respected me. Having said all that, you are correct in saying there are many options. I always try to look for the ‘big picture’ and then approach each horse and situation as an individual. The variety is what I enjoy…correction….LOVE about training horses. Check out this video to see a ‘less traditional’ application of training. I opted for this method, which I made up on the spot, because my friend had just bought a BIG filly that was unhalter broke and I didn’t want to work her as hard as traditional round penning would have required. So I applied the round pen ‘theory’ for use in a stall. Good question — I was wondering the same thing about the “timing” of the desensitization. This diary has become sort of an obsession with me…I remember watching your “Roxy ride” for the first time and sitting dumb-founded, thinking, “this has got to be fake.” Loved it. (Still re-watch every so often.) I have a question regarding Jac’s on- and off-side tendencies. I think I heard you say he was just halter-broke when you got him; what other involvement had he had with humans? Any way he could’ve “learned” to be wary of letting people on his off-side?? 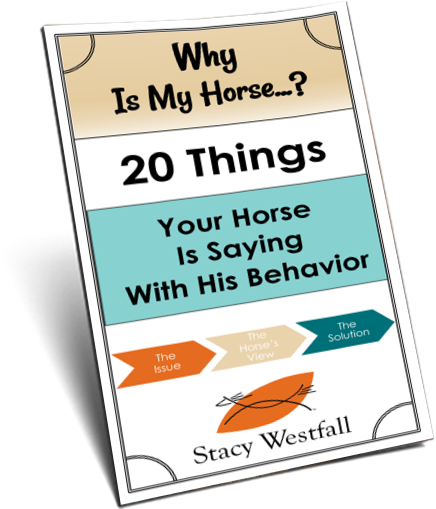 Any thoughts about why some horses — maybe some that’re “dominant,” as Jac and my gelding tend to be — are so loath to let a human do stuff to them on their off-side?? I appreciate ANY time you have to answer that…hopefully it makes sense! I can’t wait for Episodes 5 & 6 so you guys can see where this is going! I can see where the question came up about the order. Especially watching the video vs being there live. Some of choosing the order comes from the ‘feeling’ in the air. Like walking into a room of people and being able to feel if a fight just ended, or if a joke was just told. Watching the video I think it is easier to ‘forgive’ Jac for his little steps towards me. Live and in person there was a defiant feeling and a challenge. Like a ‘joke’ told with a smile on his face….but with underlying meaning. So I needed to keep him out of kicking/biting/striking range. Those three steps quickly toward me would have been hugely different if they had brought him close. He started far enough away that they didn’t. I also find it easier to get from side to side from a distance as the horses that are uncomfortable with me there are more comfortable when I am further away. The next episode will go into this further. I am confident that Jac was never beaten, or anything like that, from his off side. Horses are funny because they can be similar to dogs; I have seen dogs aggressive because they are mean, and dogs aggressive because they are scared. And that can be the same dog. Horses get confidence from being confident in the leader. Some confident ponies are confident because they know THEY are the leader. Other scared horses (Roxy was like this) get confident when they know you are a strong, reliable leader. I wish I could speak for your horse more but things get so complex and much is lost in email. I truly hope the videos help you as you follow Jac’s progress. Thanks so much for the response…I certainly didn’t expect you to diagnose my horse from afar; I guess from having watched Jac respond VERY similarly to my horse (and pretty much knowing neither had been beaten, on the off-side or otherwise) I find it “comforting” to know there’s another horse out there that reacts as mine once did! 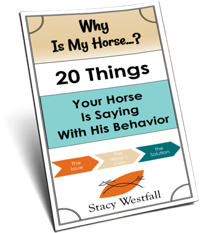 I guess when you trust a trainer working with your horse and s/he says something like that — “your horse must’ve been beaten on this side to make him respond this way” — it makes you think it’s a possibility! I’m glad to hear what I suspected…that it can be just one of those things. Thanks again and keep these video diaries coming! LOVE them! I wish everyone would understand the theory behind this. Never more so than at this moment when I am 7 mo pregnant and people are sending my husband their fall 2 yr olds and some I can’t handle and take to him because they’re so overly desensitized they have no concept of personal space. Yikes! I remember that time of life. I had my boys in ’98, ’99 and ’01… so I was pregnant for a few years straight, lol. I did more than I should have in the barn when I was pregnant. I met a nurse at a horse show, a woman I knew through a family member, and she gave me a kind-but-firm lecture. It went something like, “You see horses and the risks horses pose because you have seen bad things happen. I’m a nurse in the prenatal unit. I see pregnant women and see the risks.” She said it better, but you get the drift. Be extra careful…especially when people haven’t taught them any manners. And take extra videos of the kids! I watch the videos of mine when they were young and just love their little voices. I remember watching those videos previously. Great job! Your method shows such profound patience and understanding of the horse. Just watching and listening is so informative. thank you for posting these lessons! Thank you for answering my question! I’m always so grateful for learning new approaches and tools because what may work for one horse, might not work for another! Lol, I was meaning to write to you to tell you I used your question…but you found it first. Did you follow the reasoning?